An EU initiative shows promising developments towards improved wireless connectivity between networks and users. The demand for broadband content and services worldwide is growing at a tremendous pace. Soon, traffic from wireless devices will exceed that of wired setups. Currently, high-resolution videos account for about 69 % of all data viewed on mobile devices and are expected to reach 79 % by 2020. At this pace, short-range wireless communication will soon require data transfer speeds of tens of Gbps, which current wireless technology cannot support. A research consortium supported by the EU-funded iBROW project has made great strides towards improving connectivity between networks and wireless users. UK semiconductor technology developer and project partner CST Global Ltd has recently proven the feasibility of multi-gigabit data transmission at a 1 270 nm carrier wavelength. "The objective of the iBROW project is to establish the best millimetre-wave (mmWave), baseband radio over fibre (ROF) ultra-broadband solution. The performance characteristics of 1270-nm, detuned, in-plane, ridge waveguide, distributed feedback laser diodes demonstrated [that] it is an ideal ROF carrier wavelength," says CST Global research engineer Horacio Cantu in an article on the Photonics Media website. "We previously showed that 1310 nm was an effective transmission wavelength. We are confident that this new technology will also be feasible at 1550 nm, which will deliver an ultra-broadband, low-latency solution, extending transmission distances up to 25 km," Cantu adds. ROF technology uses optical fibre links to send radio frequency signals. Its advantages over existing solutions include a higher transmission capacity and reduced sensitivity to noise and electromagnetic interference. ROF also requires no digital-to-analogue conversion, resulting in smaller delays in data transmission. In its research, iBROW is using the 300 GHz region of the radio spectrum, which offers wireless data rates that are up to 1 000 times faster than the rates available at the moment. The project's advances have been made possible through the exploitation of resonant tunnelling diode (RTD) transceiver technology. RTDs are compact, high-speed semiconductor devices that can function as transmitters and receivers. "They can be modulated using electronic or optical signals and can also be used to modulate lasers. 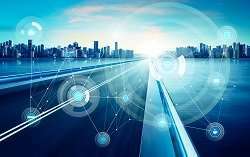 This makes them potentially valuable as a link between fibre and wireless domains," explains Dr Abdullah Al-Khalidi of Glasgow University, a leader in the terahertz electronics field and coordinator of the project. "iBROW has made significant steps in manufacturing high-performance RTDs using silicon wafers," he says. iBROW (Innovative ultra-BROadband ubiquitous Wireless communications through terahertz transceivers) achievements will be built on to develop compact, energy efficient, commercial ultra-broadband ROF technology that meets 5G fibre-optic network requirements.